You can turn a hobby into a home business, or you can take a skill acquired from your job or volunteer work and go out on your own. The next step is determining how to turn your idea into income. There are essentially three ways to make money. You can sell stuff, you can sell your skills, or you can sell your knowledge. For example, you might open an online store selling baking goods if your passion is baking, or you could provide baking services to others, or teach baking skills. This list is by no means complete, but it might lead you to more potential ideas. Arts and crafts home business ideas: Faux painting home interiors, furniture refinishing, gift baskets, picture framing, stained glass creation. If you're the artsy type and you have a gift, you might be able to turn your creations into a solid business. Health and medical home business ideas: Medical billing and coding, patient or health advocate, health coach. Online home business ideas: Affiliate marketing, blogging, eBay, Etsy, Google Adwords consulting, information products. As for catering, why not deliver homecooked meals from your own kitchen? Who says you have to invest in a commercial setup and do large events for hundreds of guests? 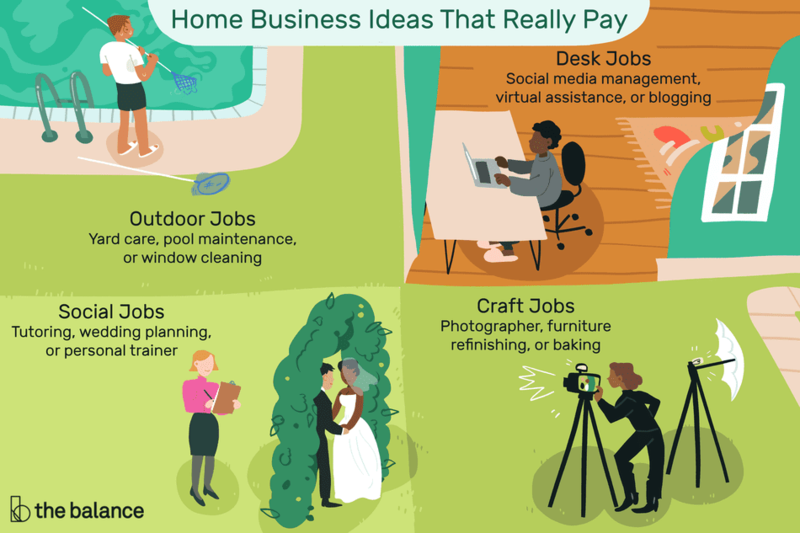 Choosing your home business idea is just the first step. Research the viability of your idea to determine if there's really a need for it in your area. Write a business plan. Create your marketing strategy. Set up your business entity, creating a business name, deciding on your business structure, and getting any necessary licenses and/or permits. To help you through the process, check out Start Your Home Business in a Month, a four-week guide to all the tasks you need to complete to get your business up and running in 30 days.